The scoreboard screen displays the rankings of each player in the game in each of the categories (sustainability, economics, energy, and environment). 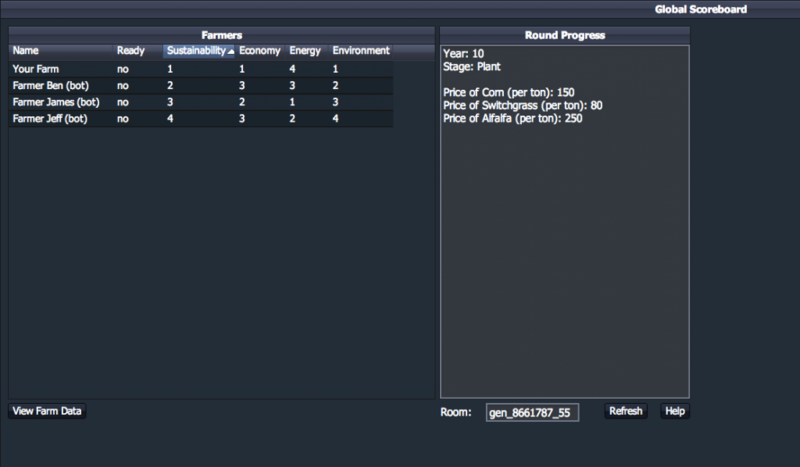 It also contains global environmental data on the right hand console window. This screen is very useful for a multiplayer game. We envision that the instructor would project this scoreboard on a classroom overhead so students could keep track of how they measure up to their classmates in the various categories. It also helps determine a winning player. The scoreboard can be reached a number of different ways. If playing a multiplayer game, it will automatically pop up in the moderator's browser once he or she clicks "Start" to begin the game. Clicking the "Scoreboard" button in the moderator screen will also bring it up. If playing a single player game, the scoreboard can be reached by clicking the "Scoreboard" button located just to the top right of the player's fields. It is also possible to just navigate to the Fields of Fuel landing page and select the "Scoreboard" link in the bottom right-hand corner of the screen. However, you will have to enter the room name to access it this way. The scoreboard screen has a number of features that can be useful for multiplayer gaming. First, it is possible to view the graphs of any player in the game by selecting his or her name in the player list and clicking the "View Farm Data" button at the bottom left of the window. This can be an effective way to analyze which strategies are producing the most sustainable outcome. Another feature that is perhaps even more fundamental is the ability to sort the player list by category. If you click the header text of any category, the list will sort the players by who is leading in that category. The console window at the right of the screen also displays some useful information. Here is contained the year, the round stage, and the crop prices. As an aside, this area of the screen will most likely be updated as further game development takes place.